Some photos are iconic, capturing a particular mood, event, or time period. For example, who isn't familiar with this photo? 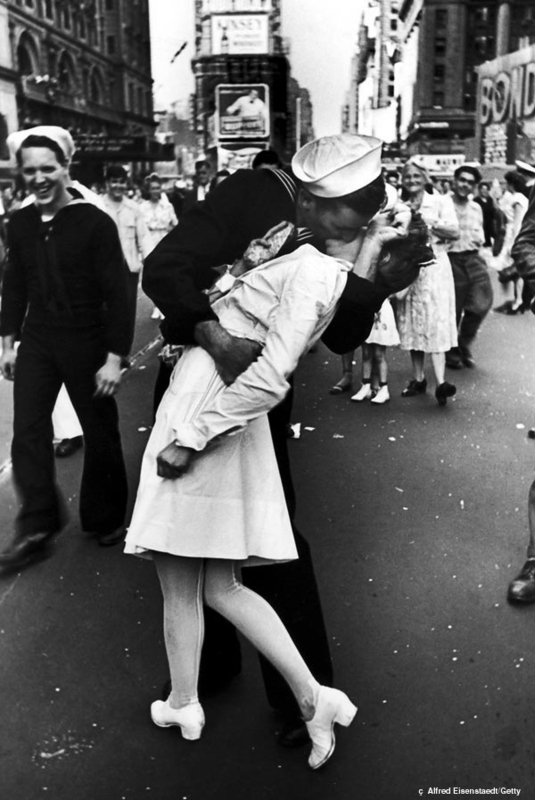 This photo was taken by Alfred Esenstadtfor for Life Magazine on Aug 15, 1945, capturing the Times Square celebrations that marked the end of World War II. I've adored this picture for years. I had a poster of it hanging in my apartment all through grad school. Not having lived during the time period, it communicates to me the sense of jubilation, pride, and relief that must have accompanied the end of WWII. There is something romantic about it. Not necessarily in the sense of romance between man and woman, but the romanticism of a time period that seems somehow nobler than the one in which we currently live. So, why post about it now? Today, Edith Shain passed away at age 91. For years, Ms Shain has claimed to be the nurse in this famed photo. To read more about Ms Shain and the photo that has come to represent the end of WWII for so many, click here. Rest in Peace, Edith Shain. Thank you for your contributions to our country.